Oxyplast Powder Coatings have developed PR and PE polyester grade products to suit multiple substrates. Powders specifically designed for aluminium cannot offer the qualities or protection provided by a truly versatile product when used on varying materials. Oxytech can provide a single product which offers a decorative and durable finish across a broad range of materials such as architectural aluminium, structural steel, zinc coated steel, media-blasted metals, steel and alloy castings and many other ferrous and non ferrous substrates. Each product is manufactured to give superior coverage, hiding power and luxurious finish with the added benefits of “out-gassing tolerance” for porous surfaces and “advanced edge film-build” on sharp edges offering crucial protection for Australia’s harsh environment. The use of high performance pigments and resins present excellent UV stability and ensure that a superior product is provided every time. Oxytech recommends using a suitable powder primer as part of the coating process to maximise the life span of the coated finish. 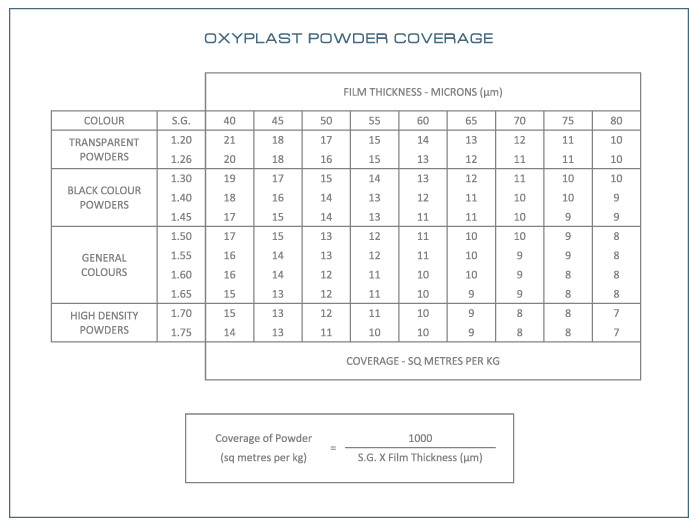 All Oxyplast primers supplied by Oxytech offer the same “out-gassing tolerance” and “advanced edge film-build” as the PR and PE polyester powder coatings with the added strength of Epoxy resin systems. Oxyplast ‘Zincoprime’ is a zinc-rich epoxy primer which provides very good corrosion resistance when applied over media-blasted steel. Oxyplast ‘Epoxyprime’ is a pure epoxy primer for long term use over aluminium and zinc coated steel. These primers are highly recommended for extensive heavy industrial and environmental applications. Maintain both the aesthetic and functional properties of your powder coated finish by regularly cleaning the coated surfaces every six months. In harsher environments with high levels of salts or pollutants such as coastal or industrial areas, cleaning should be as frequent as every three months. This will keep your powder coatings looking good for many years to come. Remove coarse or loose dirt with a soft wet sponge or cloth. Wash the powder coated finish with a warm, mild detergent solution to remove any salt, dust and other deposits with a soft cloth, sponge or brush. After cleaning, rinse the powder coating with clean, fresh water. Be careful not to damage the powder coated surface during cleaning by using harsh materials and cleaners such as steel wool, scouring pads, scrapers, abrasive liquids or powders. Using such cleaning products will scratch and dull the powder coated finish. If solvents must be used, mild solvents such as Isopropanol, White Spirits, Turpentine or Oxytech Prepwash are recommended. Always test a small, unseen area of the coating prior to cleaning with solvents.